Okay! I’m awake (I think). But I’ve got coffee and I’m ready to go! We’re starting the morning strong – the first six hours are always the most telling – and there’s already lots of chatter on Twitter and Instagram about the ‘thon, especially since there are a number of you who don’t live in the U.S. and have been spending the last six hours deep in a book, not deep in the covers like me. But if you’re following the official time clock, first thing in the morning is the perfect time to get the brain moving. So I’ve got an introductory survey, just some getting-to-know you questions, since we’re all about to spend the next 42 hours together. Where did you hear about the readathon? I’ll randomly draw one person who completes the survey to win your choice of a $10 Starbucks gift card, $10 Amazon gift card or your choice of a book (US$10 or less) from Book Depository. This contest will be open for the whole weekend and I’ll post the winner in the final check-in post at midnight ET tomorrow, so if you’re joining in late, you can still win this one. Happy reading, ‘thoners, and I’ll see you back here in six hours! Nope. This is actually my first readathon! LittleBookOwl. She made a calendar of most readathons. Hunger Games! Should I be ashamed for not reading it? Reading books is my New Year’s resolution. Where in the world are you reading from this weekend? I am reading from Southern Indiana today. Have you done the 24in48 readathon before? This is my first one. Where did you hear about the readathon? I had started noticing blog posts about 2 weeks ago and then Twitter posts during Bout of Books. I made the decision to join late Friday. What book are you most excited about reading this weekend? I really want to finish The Girls from Ames for book club, since our meeting is next week. Tell us something about yourself. I am a librarian who likes mainly YA books and I love history. I also love unicorns and have collected unicorn items since I was little. Remind us where to find you online this weekend. I will be posting on my blog, http://floodbooks.blogspot.com/, and hopefully on Twitter @SarahFlood. @shriya725 Make sure you post this as a comment on the blog, or it won't count! Hello my name is Allysa. 2.. Yes, I participated in July for the first time. 3. I heard about it from the the twitter account. 4. I am most excited to read 13 Bullets by David Wellington. 5. I like to read not just for the amazing worlds I enter but to better understand the craft of writing. I did it once over the summer. I heard about it through a BookTuber. I think Lindsey Rey. Amy & Roger’s Epic Detour. Its kind of a love story. I’m usually not into love stories but this one sounds good. I’m a junior majoring in English. I’m ashamed to admit that the readathon slipped my mind until late yesterday! So glad I saw all the tweets about it so that I didn’t totally forget! 1. From my bed and sofa and other sofa. And maybe a chair. All of those things are located in southwestern Ontario in Canada. 2. Yes, this is my second time. 3. I initially heard about it via a tweet from someone I follow but I now follow 24in48 on Twitter and subscribe to the blog’s RSS feed. 4. I haven’t picked anything out – I’m just going to pick up whatever strikes my fancy. So I’m pretty excited about seeing where the weekend takes me. 5. I’m wearing my Books are in my Wheelhouse t-shirt today and have set aside my library stamp t-shirt for tomorrow. 6. Well, I’ll be at janeycanuck.com when it’s time to update progress and I’ll be on twitter and instagram at @janeycanuck on both. http://readingbetweenthelakes.com/2016/01/16/24in48-readathoning/ Answers are posted on my blog! I love reading non-fiction history. No , this is my first social readathon and I am really looking forward to it. I am addicted to horror novels and am in the process of trying to build a collection of 80s paperbacks from the greats. 1. Where in the world are you reading from this weekend? I’m a Canadian reading from home in Mexico City. 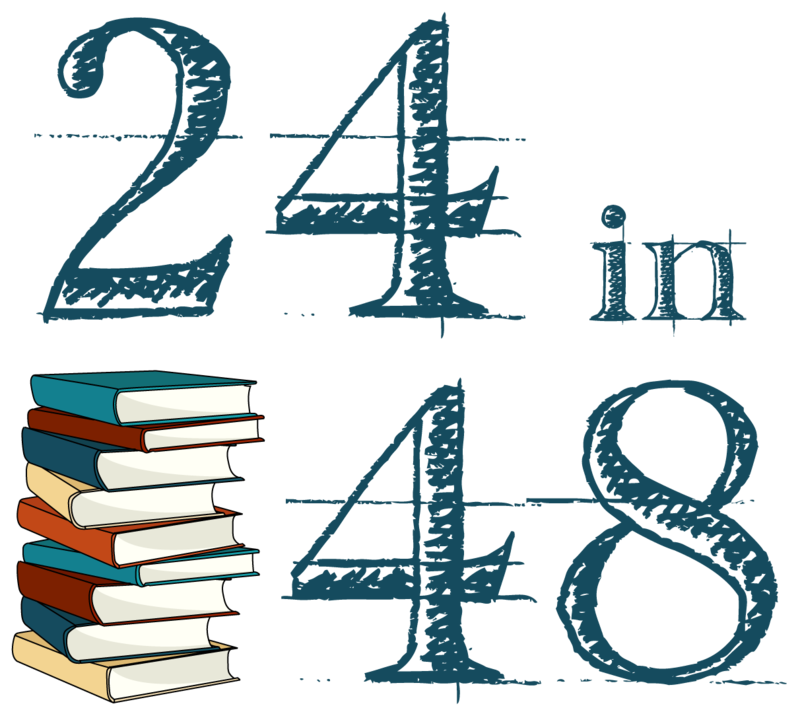 2.Have you done the 24in48 readathon before? No. This is my first time and I’m excited to be doing it! 3.Where did you hear about the readathon? I was lucky enough to stumble upon a tweet earlier this week advertising the readathon. 4.What book are you most excited about reading this weekend? I’m excited to (FINALLY) finish Gore Vidal’s novel ‘Lincoln’ this weekend as it really seems to be the #bookthatneverends. I’m not hating it like I originally did (it’s a book club read) but there are other things I’d rather read. Plus, this will be my first finished book of 2016 and I want to hit that mark! 5.Tell us something about yourself. I’m a single mama living abroad so I’m curious to see how close to the 24 hour reading goal I can get. Audiobooks are my saviour and so far that’s all I’ve read this morning (of the aforementioned tomb Lincoln). 6.Remind us where to find you online this weekend. Where in the world are you reading from this weekend? Long Beach, California! Have you done the 24in48 readathon before? Nope, but I love readathons! What book are you most excited about reading this weekend? I’m finishing off four books, so I’m excited to get through all of them! Tell us something about yourself: Studying to be a librarian! Have you done the 24in48 readathon before? yep. This is my third, I think? 1. Reading from Fargo, ND, USA. 2. I’ve done #24in48 at least four times. I’ve lost count! 3. Also don’t remember how I heard about the readathon. Most likely a book blogger friend. 4. I’m most excited to read Gloria Steinem’s My Life on the Road. 6. Twitter and Instagram are @jmillwanders. Blog is http://jmillwanders.com. Have you done the 24in48 readathon before? nope! Where did you hear about the readathon? I followed on twitter last time I heard about it, though still somehow missed hearing about in time this year! Tell us something about yourself. I’m a huge romance fan. 2. Have you done the 24in48 readathon before? 3. Where did you hear about the readathon? 4. What book are you most excited about reading this weekend? 5. Tell us something about yourself. 6. Remind us where to find you online this weekend. Thanks for starting this awesome weekend!! Through a friend and The Little Book Owl’s booktube. I have 30 different types of tea in my cupboard even though I’m a coffee addict. Where in the world are you reading from this weekend? I’m reading from Raleigh, North Carolina, USA. Have you done the 24in48 readathon before? I have not… so I’m excited to try this out for the first time! Where did you hear about the readathon? I follow LittleBookOwl on Youtube and she does a video about some of the major readathons that happen during the year. What book are you most excited about reading this weekend? Probably Passenger by Alexandra Bracken. Through The Little Book Owl’s booktube. 1 – I’m reading in Zürich, Switzerland. 2 – First time doing any readathon. 3 – Somewhere on the web, possibly Twitter, but not sure. 4 – I actually already finished the book I was most looking forward to – “Miss Peregrines Home for Peculiar Children” and it was amazing!! The next one is an older one – Wool. For my 2nd #24in48, I’m reading from Palatine, IL. Tomorrow is supposed to be frigid, which gives me the perfect excuse to not leave the house on Day 2, allowing plenty of time to get some reading done! I am most looking forward to reading George, which I am about to start shortly. I have 2 cats which also enjoy the #24in48 because it means that I spend a lot of time at home with them! Looking forward to getting to know some of you today! You can find me at http://www.readingwritingandrandommusings.com or at Twitter on @rwrmusings. All the social media. Either Twitter or Instagram. I already finished Undermajordomo Minor and that was a lot of fun. I’m starting in on Bad Feminist now. I’ve been meaning to read it since it came out and I’m glad to finally be getting to it. I’m a librarian, a book blogger, and a cat mama. Little Book Owl on Youtube – she’s put up a year’s worth or Read-a-thons on her youtube! Reader, gamer, sunset-gazer, book-blogger, paper-folder, sock-collector, food-lover, hot chocolate-drinker, geocacher. I’m reading in the US, sunny (but not really right now) Arizona, and this is my first readathon ever, which I found out about on Twitter. I think there’s not one book in particular I’m excited about because everything I plan/planned to read I’ve been looking forward to in one way or another; I just love reading all kinds of books so I’m happy to have a reason to do it for 24 hours this weekend. It means I won’t really have time for my friends and family(unless they rudely decide to interrupt) or movies or game playing or craft of one kind or another or working out, but I’m good with that for this special event (and reading tends to slip to the top of the list anyway). I will miss what writers and readers are talking about on Twitter (@akaTheReader), though, because that’s definitely one of the other things I love to do: talk. Whether about books or other topics, I adore discussions. So happy this exists and I just wish I had more time to look at what others are doing with their #24in48! I’m super late in doing this… I tried to stay offline most of the day, lol. Tell us something about yourself. On-the-verge-of-retiring bookseller. Grandma of 7. Have you done the 24in48 readathon before? This is actually my 2nd one! Tell us something about yourself. Well, I made a goal to read 100 books this year. It’s on now. Have you done the 24in48 readathon before? Once before, summer 2015. Where did you hear about the readathon? Book Riot? I’m actually not sure. What book are you most excited about reading this weekend? Super excited to hopefully finish Jane Eyre by Charlotte Bronte. About halfway through, I love it so far and I’m sad it took me so long to read it. Tell us something about yourself. I’m a slow reader and I have a bad habit of buying way too many books that end up in TBR piles for way too long. But I suppose there’s worse habits to have! Tell us something about yourself. My goal is to read 60 books this year, 12 being very large, 400+. This will be quite the challenge because I have big book fear, am a slow reader, and have a short attention span. Wish me luck! From the Biggest Little State in the Union! This is my first, but it won’t be my last. This is fun! I can’t remember. Was it Book Riot? Finally getting to my Buffy & Angel trades. I usually read them as soon as I get them but somehow I’ve let a few pile up. Where I’m reading from – Texas. Have you done the 24in48 Readathon before? No, this is my first readathon. Where did you hear about 24in48? Book Riot somewhere – maybe All the Books. What book are you most excited about reading this weekend? A Little Life! Tell us something about yourself: Hm. I usually like to listen to books while doing other things – like walking or knitting. I’m determined that this weekend I will read with an actual book in my hands for at least part of the time. So, I’ll be listening to books, reading actual books, and reading a digital book this weekend. If I don’t have knitting in my lap, there are usually a couple of cats! Where to find me online: I’m KarmaKnits on Instagram and Twitter. Where in the world are you reading from this weekend? Mostly my home, just outside of Indianapolis, IN. What book are you most excited about reading this weekend? A manuscript that I’m doing a final read through for a friend. Tell us something about yourself. I’m a writer who is procrastinating actually reading my most recent manuscript. Remind us where to find you online this weekend. You can find me on the Tweeter; @msannalangford. I’m reading in Tucson, AZ. This is my first 24in48 and I found out about it through lots of channels. I was probably most excited about Manners and Mutiny, the final Finishing School book, yesterday. I haven’t decided what I’m reading yet today. Something about myself? I’m a librarian and I love choral masterworks. Also friends of the library book sales. One of which is happening right now. And I’m avoiding. Because I have too many books and haven’t read any of the books I bought at the last two I’ve gone to. Have you done the 24in48 readathon before? –> I attempted it once before, but didn’t make 24. Tell us something about yourself. –> This is my first year as a librarian! Where in the world are you reading from this weekend? The lovely city of Boston! Tell us something about yourself. I have two awesome cats who have been taking turns spending time in my lap while I work through this pile of books. Where in the world are you reading from this weekend? Illinois! Have you done the 24in48 readathon before? Yes, once I think! Where did you hear about the readathon? On twitter I think! What book are you most excited about reading this weekend? Carry On by Rainbow Rowell! Tell us something about yourself. I’m an elementary school library, but love to read MG/YA for fun. Remind us where to find you online this weekend. @bookgoil on twitter, if you click on my name you’ll get there! I am in Cypress, TX. Right outside Houston. I heard about it on the All the Books podcast by Book Riot. I decided to just lsiten to a 25 hours long audio book. I am listening to Purity by Jonathan Franzen. I teach eight grade Science, so reading is a welcome escape. Here are the answers to the Entry Survey that was posted at hour 6. 1) I am reading from london and will be for the whole 24 hours. 2) I have not done this readathon before and so i was excited penciling it in my planner. 3) I heard about the readathon from a booktuber who was talking about readathons this year. 4) I am most excited to read City Of Fallen Angels because it will help put me into a Shadowhunter mood for reading. 6) People can find me on my twitter or on here for an overview of the event. Nope. This is my first — but definitely not last — time. I don’t know exactly who posted it but I saw it on Twitter last summer. None in particular but I am most excited about finishing up a few books I’m in the middle of. I’m almost 33. I love dogs. I tend to read popular fiction. I love Jesus, Pretty Little Liars, and cross stitching. @kristaonpurpose on both Instagram and Twitter! Nope, never actually completed a readathon. Let’s make this my first! I think it was someone’s TBR on Instagram or Youtube a week or two ago. My memory is not fine for this. Probably Dragon Keeper by Robin Hobb. Been on my TBR for so long. Finally reserved it at the library! I waste my life away on music and play Fiddle, Bass Guitar, Guitar and Piano. I also volunteer at the library on Saturdays, which us gonna make this readothon super hard haha. I’m going to try though! Texas, USA. I live in a small town near Austin. Where did you hear about the readathon? I can’t remember. I’m 50. I work in a library. I’m left handed. I have a Little Free Library in my front yard. @24in48readathon 1. North America 2. No 3. Twitter 4. House on Mango Street 5. I am exhausted of surviving white supremacy every day I live. I am reading in Felton, DE! At HOME! Yes, this is my third time! Spill Zone by Scott Westerfeld! I traveled with three dogs and three cats after living in Mexico City for six years, and now am n DE!